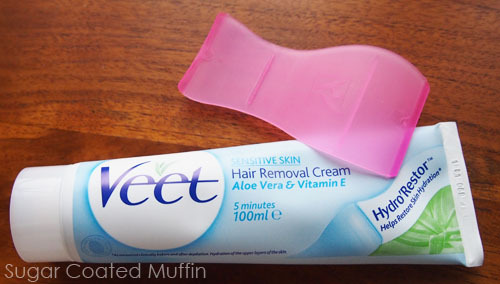 In this post, I'm going to show you how to use Veet Cream to remove body hair. 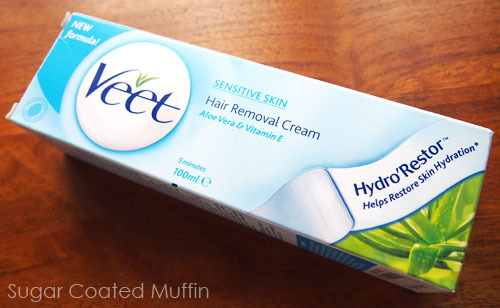 After trying the Veet Wax Strips, I moved to hair removal creams. Preferably something easier and well, pain-free xD Plus it was on discount so I grabbed it at RM 14.68 only! ^_^ Chose the blue one for sensitive skin. The other variants recommend leaving on for 3 minutes but this one is 5 minutes. It also helps to restore skin hydration which I really need. It attacks the hair near the root so hair regrowth should be slower & skin should be smoother. Read the instructions before use!! If you're lazy then scroll down as I've already down how to use the Veet Craem here. Precautions : Do not exceed 10 minutes! Do not apply within 72 hours from last application. Apply & remove using the spatula only. I got some of the cream on my finger before application and didn't care. Bad mistake.. My finger was a lil sore after that. Comes with pink spatula with 2 sides. Bigger side for big areas like legs and arms while the smaller side is used for curved areas. How to use Veet Hair Removal Cream? Nah.. Here is the step by step instructions. And then because I love looking at myself, I must anyhow insert pic of self into post. 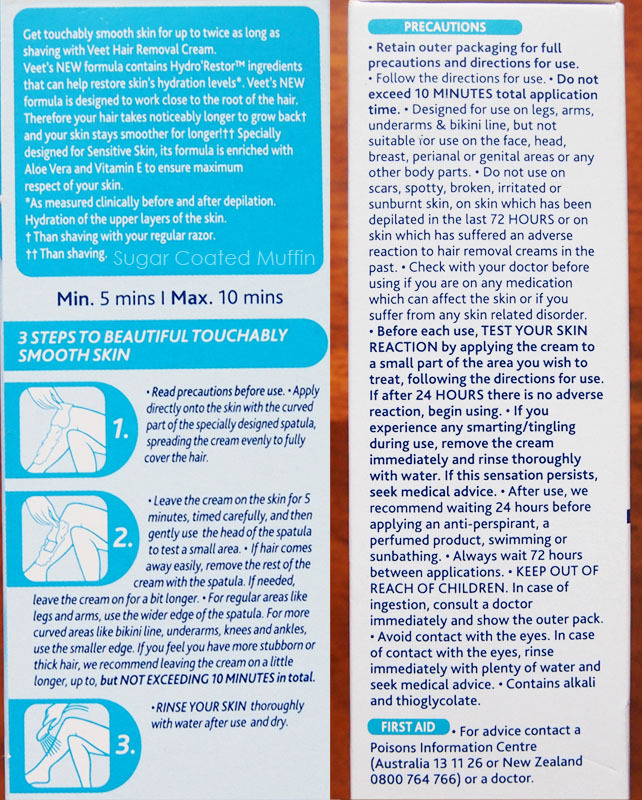 How I know how to use the Veet Hair Removal Cream, it's so easy to use! You must time this well and make sure you don't exceed 10 minutes! Usually by the time I'm done with the 2nd leg (apply slowly and evenly; make sure it's not too thin), it's time to start removing the cream from the first leg. I think it removed up to 99+% of my hair which is awesome! If it doesn't come off with the spatula, I rub my skin gently and the hair comes off. Do not do this if your skin is sensitive or turning red. My skin was sooo smooth after and it stayed like that for a while. No annoying stubbles like when I shave. The remaining hairs are very soft. Ingredients : Aqua, Urea, Paraffinum Liquidum, Potassium Thioglycolate, Cetearyl Alcohol, Calcium Hydroxide, Talc, Ceteareth-20, Glycerin, Sorbitol, Magnesium Trisilicate, Parfum, Propylene Glycol, Lithium Magnesium Sodium Silicate, Sodium Gluconate, Tocopherol Acetate, Aloe Barbadensis Gel, Acrylates Copolymer, Limonene, Citronelol, Potassium Sorbate, Sodium Benzoate, Methylchloroisothiazolinone, Methylisothiazolinone. I still prefer the epilator, it's almost painless when you get used to it. and the hair grows out so much slower! This is so cool! I would love to try this too! I've been shaving for years, actually. This has caused many scars on my legs =( Cos when I shave, it cut the tip of my skin which holds the hair. Not at all! I do this in the bathroom and just wash away the cream under the tap. It's really easy to apply & scrape off using the spatula. how long does it stays hairless? and will the new hair come out thick and coarse like when we use regular shaver? A few days.. Slower than shaving. I feel it's softer somehow. Not so annoying. Maybe cos shaving leaves a sharp edge? I used veet hair removal cream until I heard about laser hair removal. After a research I decided to give it a try so I went to a laser hair removal Toronto clinic to gave it done. I never imagined the treatment is so powerful and effective.....its results are long lasting and by long lasting I mean years, not one- tow months/. HAIR REMOVAL CREAM, also known as epilation or depilation, is the treatment of locks, and represents the techniques used to achieve that result.Hair typically develops all over the entire individual system during and after teenage life. Men usually have more locks than females. Both men and ladies have locks on the head, brows, lashes, underarms, vaginal area and legs; and men also have locks on their face, belly, back and upper body. Tresses does not generally grow on the hands of the hands, the mouth, certain areas of the vaginal framework, or you of you.Forms of locks treatment are practised for a number of reasons, such as social, sexual, medical and spiritual. Types of locks treatment have been practised in almost all individual societies. The techniques used to eliminate locks have different in different times and areas, but cutting is the most common method. Veet, formerly called Neet and Immac, is a current trademark of chemical depilatory internationally-sold products manufactured by Reckitt Benckiser. Hair removal creams, mousses and gels, and waxes are produced under this brand. It has previously created similar products under the names Neet and Immac. Veet's hair removal products contain thioglycolic acid and potassium hydroxide. These ingredients react to generate potassium glycolate, which according to the company, increases hair loss. I've been using this a year ago, but now, I'm pretty in love with the effectiveness of the Colorado laser hair removal. It's a little bit expensive but its very effective for me. Great reviews. I tried some hair removal cream and I am satisfied with the result.. Hhhhmmm... I think I should give this a try. I tried laser hair removal michigan because hair removal cream didn't work and I love it! My hair is severely matted..?